Some people just have great skin, while the rest of us who lack that lucky predisposition, have to work hard for it. Hyperpigmentation can happen very easily and very quickly and can take months to get rid of. That doesn’t mean that you have to spend tons of money to get an even complexion, you just need to know a few tricks. Essentially, hyperpigmentation is leftover inflammation that forms after acne has started healing or if acne has been aggravated from picking. Eating a healthy dose of anti-inflammatory foods like fresh fruits and vegetables (can we say green juice?) and wild caught salmon, as well as leading a low-stress healthy lifestyle will greatly improve hyperpigmentation. These will nourish and keep you hydrated because, without hydration, skin cells tend to get “sticky” and won’t turn over in a timely manner. New cell turnover is a must when trying to lighten up dark spots, scars, and uneven skin tone caused by acne and other skin ailments. Staying hydrated is key, but sometimes our skin needs a little help slewing off dead skin cells especially if you live in polluted areas as I do. Whoo hoo, Los Angeles! I know that I have to exfoliate at least 3 times a week to keep my skin happy and hyperpigmentation at a healthy distance. To do this, all you have to do is use a cloth like this one, or, you can make the sugar scrub described below. Once you’ve got it, hyperpigmentation can be difficult to lighten and smooth out, so patience and a little TLC is important to implement. Hyperpigmentation can happen just by squeezing a blemish or staying in the sun too long, especially when you have acne scars, so don’t pick and be sure to shade your face from the sun during treatment. Also, treat your skin nicely and lovingly care for it, it will make a difference! Thinking negatively won’t help heal your skin. Tip # 4- Don’t pick! Picking acne will increase inflammation and make existing hyperpigmentation worse, so it’s best to just leave your skin alone. Simple as that! Turmeric is a powerful anti-inflammatory. It reduces the occurrence of blemishes and lightens pigmentation, which might sound counterintuitive considering turmeric stains pretty much everything. However, using a mask with a dash of turmeric powder 2-3 times per week will literally lift hyperpigmentation “stains” right off. This stuff is amazing! To use, simply add 1 tsp of turmeric powder (preferably fresh) and mix it into 1/4 cup raw honey , full-fat yogurt, aloe vera gel , lemon juice or even fresh cucumber juice to make a mask that is easily spreadable and not too runny. The mask should be a pretty vibrant orange color. Let the mask dry then rinse with warm water. If you use full-fat plain yogurt or honey, you can leave this mask on for as long as you like. I love using turmeric powder by this brand . Simply slice a lemon and gently rub it on dark spots to lighten them. Let to juice sit for 10 minutes and then rinse off thoroughly to reveal soft lighter skin. If your skin is sensitive like mine, try mixing fresh lemon juice with aloe vera gel or honey to lessen the sting. Never apply lemon juice to open or irritated skin. Ahhhh, aloe! How I love thee! This stuff is awesome for hyperpigmentation and one of the most gentle. Its natural salicylic acid content is perfect for lightening, evening out skin tone, and getting rid of dry skin, plus it’s jam-packed with nutrients that will do more than just get rid of hyperpigmentation. Aloe vera is also anti-inflammatory and anti-microbial, making it perfect for treating acne prone skin as well. Aloe is one of the most convenient ways to treat hyperpigmentation as it can be used anytime you need it and can be left on the skin without having to wash it off. All you have to do is apply it on problem areas after cleansing as many times throughout the day as you want. It can also be worn under moisturizers and make-up so that you can treat uneven skin tone without any hassle. If you don’t have fresh aloe on hand, this brand of aloe vera gel is one of my favorites. Read more about my favorite clay here. In many cultures around the world, women have used full-fat milk and yogurt to whiten and smooth their skin and guess what? It works! Yogurt contains lactic acid, a gentle but effective natural form of hydroxyl acid that exfoliates, softens skin, and lightens dark spots. Apply full-fat plain yogurt to problem areas and let sit for 20 minutes twice a week until noticeable hyperpigmentation has faded. I like to use greek yogurt for this and will usually apply it with the leftovers from my yogurt cup. These oils are so restorative, hydrating, and refining. They speed up the recovery of the skin whether it’s from acne or even just when your skin needs a little boost. Argan , tamanu , and rosehip oils will replenish the skin and quicken healing, decreasing the chances of getting hyperpigmentation. If you’ve already got it, applying these oils will help lighten them faster. I use at least one of these oils daily as my regular moisturizer morning and night with a spritz of hydrosol (my favorite is rose ) to balance my skin’s PH levels. I have found that doing this has greatly improved my existing hyperpigmentation and seems to prevent it too (or at least it doesn’t seem to be as dark initially like before). You can use these oils as I do, usually, a few drops massaged into the skin, or just apply them to dark spots. If you’re not sure about what oil to begin with, you can read about over 80 carrier oils and their comedogenic ratings here. Wheat germ oil is full of essential fatty acids, vitamins, and minerals. One of its most prominent nutrients though is Vitamin E. Wheat germ’s high vitamin E content make is perfect to use for skin regeneration and healing. It locks in and maintains moisture like no one’s business, very important for even cell turnover. If you use this stuff at least once a day on problem areas for a few weeks, your hyperpigmentation should become a few shades lighter. ***This oil should be used VERY carefully as it has a very high comedogenic rating. You can buy wheat germ oil here . This serum features a few powerful essential oils that reduce discoloration, even skin tone and brighten the complexion with consistent use. It also heals blemishes and helps fight new breakouts! You can learn how to make it here. Using granulated sugar as an easy DIY exfoliator is a cheap and effective way to gently remove layers of pigmented skin. Since exfoliation is one of the key methods for getting rid of hyperpigmentation, I highly recommend making your own to save some money. What methods have worked for you at getting rid of hyperpigmentation? I used a face wash that has Salicyclic acid and alpha hydroxy acid in it and didn’t know i shouldn’t expose myself to sun because of the alpha hydroxy acid in it now my face is darker than my body have tried a lot of natural remedies but it’s still not clearing..
You will want to make sure that you wear sunscreen (go for spf 30) every day. Additionally, you may want to look into a good vitamin C serum to use at night. This will help lighten the darkness. Best of luck! I have a very bad skin tone due to hyperpigmentation my whole body is filled with dark spots and my elbows and knees are literally dark and uneven skin colour please suggest me some home remedies for how long I must follow,to get rid off these problems. Hi, my friend has pigmentation marks on her face, she has tried a lot of costly mediciness, treatments and many more but nothing worked. Now she asked me for a solution, then I want to ask whether the first solution in your natural remedy really works, if yes then will it work without yoghurt? Or yoghurt is necessary for the remedy? Thanks, for sharing this information with us. I really found this helpful and I also believe that these tips and tricks help me out with my problem. hope you will share more content like this. I have hyperpigmentation lines tracing where my buttocks meets(sorry for the visual). I noticed they started when I started waitressing 8 months ago. They don’t scrub off but definitely makes it look dirty down there 🙁 any suggestion for the darkening skin lines? Any idea what is causing them exactly? You may be able to at least prevent them from getting worse. Unless you go the route of lightening creams, serums, etc. I’m not sure that there is a ton of natural options you can try in such a delicate area. I wish I could be more helpful! I had hyperpigmentation from too much sun exposure. Its genetic in my family, but the sun makes it sooooo much worse. I now use the Made from Earth Carrot Serum – and it works and has diminished the hyperpigmentation. I did not know a carrot serum could do this, but this product does an excellent job at getting rid of hyperpigmentation. Hey, my lips darkened after a reaction to a sheet mask. Does lemon work on hyperpigmentated lips? If so, how long does it take for it to work? Thanks in advance. Hi i hve pigmentation but its nt going any way am trying many thngs now some one told fr using almond oil…is it beneficial..
Are you using anything else for the hyperpigmentation right now? Do you wear sunscreen during the day? Just wondering if you know of any diy ingredients and oils that can help increase tanning without increasing freckles or even soften them. I’m able to tan (lighter-med golden tan) but can freckle also. It seems that certain things I’ve tried increases freckles but the tan doesn’t increase or even decreases (like tallow). Seems like the only thing I’ve tried that does a good job of softening freckles and increases my tan at the same time when I get sun is olive oil. Any other oils or things you know of that might work? I have cocoa butter coming in the mail soon…think that’ll that work? Hmmmm… you could possibly try grapeseed oil, but I really do encourage you to be careful in the sun. Freckles will always darken when exposed to the sun and in fact, more may even appear! Suntan products (including putting on body oil before sun exposure) are formulated to intensify the suns rays against the skin, so I can only imagine that the freckles would get darker. The only thing I can think of (and don’t really recommend) is to spot treat the freckles with a gentle acid, but that would be really meticulous and more freckles would just show up in other areas anyway. Acids make your skin very sensitive to sunlight and will cause it to burn. I think your best option would be to find a self-tanner that is as natural as possible. You could then possibly treat your freckles and use a sunscreen when in direct sunlight to protect your skin from sunburn… but it sounds a bit complicated. I’m African American and would like to know what is the best scrub to use on my face and body to even skin tone and treat pigmigtation. I have small white and dark spots on my legs and scars on my arms. You can use either a sugar scrub for both face and body to help quicken cell turnover. The best thing you can do is to wear sunscreen every day and not let direct sunlight on those areas without it. The sun will make hyperpigmentation last MUCH longer. Hii I have pigmentation in the cheeks so i am trying raw milk mixed with tomato juice . Will it work to cure ?? IM 36 ,when i was younger I had nice freckles, but now they became alot more and all over my face and darker, it makes my skin looked older. also I have this skin and very dry, I put alot of rose hip oil, and sometime almond oil, I put orange essential oil mixed with aragan oil twice a week. I dont see any change with my dry and dark freckles. looks also that my skin lost collagen. I use a suncream every time i go out. is there a list of good oils all natural on your website? is the a way to stimulate collagen with an oil? Rosehip oil is a healthy oil but I think it’s a dry oil, it may be more beneficial for you to use something like macadamia oil for mature, dry skin. I have a very sensitive skin.These days my skin pores get clogged easily and i have few little comedones on my face. also lot of freckles and skin discolouration around chin and upper lip area. I have tried tea tree oil with sweet almond oil during night and can see some comedones getting better. Please suggest me to treat these skin discolouration, freckles and comedones of my skin. also mine is very dry skin. i want to start a heathy everyday skin regime for both day and night. i hope these natural oils and ingredients will work best for my sensitive skin. Can you tell me a bit more about your skin type? Is it oily? Do you by chance use a good sunscreen when you go outdoors? I’m wondering if your progress is being slowed by possible exposure to sunlight? If that isn’t the case, how long have you been using your homemade masks? Thanks for this article, I love the ideas. I think my only “issue” with these remedies is that you have to follow them every day in order to see results. It took me a while to understand now and develop these new habits. hi! I have hyperpigmentation marks left by mosquito bites for a year. Doctor gave hydroquinone creams which made them lighter. but after that new marks came up after the bites, I need a natural remedy for dark marks on my brown skin and also to prevent to dark spots from forming,,. how long they will take to clear? This is a tough one! I personally have pretty light skin and it takes MONTHS for dark marks to disappear after a bad pimple or even just a mosquito bite. The best thing you can do is use sunscreen over the area during the day if it’s exposed to sunlight (the sun makes dark spots last much longer and can even make them darker). Then I recommend using diluted lemon essential oil at night to help speed up the lightening process. Depending on how dark the mark is, it could still take weeks but at least progress will be made. hello, i’m 16 + i know acne is normal for teenagers but i have genetically clear skin as well as take care of it w/ the exception of tiny blemishes here & there. my one problem area is my upper lip. i still have a couple ‘scars’ from various pimples from middle school, that refuse to go away!! i’ve wanted to see a dermatologist, but i’m 16 and my mom thinks it will fade soon, but it’s been nearly 4 years and i still have this small but noticeable one. and now, i had this mark from another pimple on my lip again recently, but a couple days ago it flared up again and turned into another pimple, so i got a warm washcloth and it popped on its own, now i have an even worse, big bright red mark that’s impossible to miss even with makeup. Anyways, I would recommend getting some tamanu oil (this is a carrier oil) and some tea tree essential oil. The tamanu oil doesn’t smell very good (kind of like bouillion cubes…) but it’s the BEST oil for fading scars and healing marks left by blemishes. The tea tree oil can be added at a max of 15% dilution. So say you have a 1oz bottle of tamanu oil, you could add up to 90 drops of tea tree oil. I recommend doing a bit less at first to see how your skin fares, so maybe go with a 5% dilution (30 drops in 1oz of carrier oil). You would then apply this every night with clean hands on clean skin. If you can, try dabbing a tiny amount before going to school if you like. take 2 tbs of multaanimitti powder and add milk to it to make it in to a paste(add gram flour if your skin is oily). Mix it well and apply it for 15-20 mins to make it dry. Do not use fan to dry it. Wash it off with warm water. For better results you can use neem powder also along with it to clear dark spots. Thanks for the tips Anna! Are you by chance exposed to any direct sunlight after using the lemon? if so, this is the reason why your pigmentation may be getting worse. The time it takes to reduce it really depends on how severe it is. I’ve had hyper pigmentation that lasted for 8 months or more! The key is to protect your skin from the sun using a natural SPF, using gentle skin peels that contain glycol acid, keeping the skin moisturized, using skin brightening remedies, and being consistent. The pigmentation WILL lighten, it just might take some time! 🙂 You may find my most recent hyper pigmentation article helpful for more tips. Best of luck! Hey Tash. I have a hyperpigmented patch of skin on my leg. It came from a dog bite incident which occurred a year and 3 months ago. I used a number of creams that didn’t work. Recently switched to natural remedies, scrubs, kojic acid soap and sunscreen. I see slight improvement though the progress is gradual. Please give me any suggestions to help clear it faster? I actually just wrote another post on this very topic 🙂 Might be worth a try! Hi Raji! I’ve heard that turmeric is a great spice to use as a mask when mixed in yogurt! I’d give it a try. Aloe will help boost cellular turnover but be careful that it doesn’t dry out your skin! I have hyperpigmentation in my face as well and I would love to have it cleared. I use african black soap to clean my face and just apply shea butter. I don’t use anything else on my face. It keeps me from breaking out but I would love to even my skintone. Which do you prefer I use? Are you out in the sun a lot by chance? One of the best ways to reduce hyperpigmentation is protecting your skin from sun exposure 🙂 Also, I have found that gentle exfoliation 1-2 times per week helps speed things up. You can also trying adding a drop of carrot seed essential oil to you shea butter mixture. Hope this helps! I used creams with hydroquinone while l was young which caused dark circles on my face giving me an uneven skin ..Presently my body is fairer than my face … Am tired of buying skin care products. .. l also have a dry skin .. pls advise !! Do you use any exfoliants? Hi i just wanted to ask which method will work best for me as i had excema. Years of scratching has left server hyperpigmentation on my neck, back and stomach. Please can ypu suggest somehing as i suffer from low self esteem. I have had good results for a nasty eczema/melasma combination using herbal creams which have bearberry in. It is probably the best natural whitening agent youll find.. There is some research info about it here… https://www.ncbi.nlm.nih.gov/pmc/articles/PMC2801997/ The active ingredient is also called Arbutin I think.. You find it in some chinese herbal creams in particular.. The aloe is a great way to gently exfoliate the skin as it speeds up cell turnover. However, it may be drying after a while. If you happen to have fresh papaya where you live, I would try using that as a mask 1-2 times per week. It also helps to try and protect your skin as much as possible from the sun. Using honey is a great way to keep your skin glowing and moisturized. You can also use a simple homemade sugar scrub as an exfoliant once or twice a week depending on your skin’s sensitivity to help with hyperpigmentation. It will take time, but the results will come! Your article is very helpful to us. I am wondering, is it alright to use “lime” instead of “lemon” ? I am 32 years old housewife and I got big Hyper-pigmentation marks on my two cheeks. I saw your article about “get rid of Hyperpigmentation naturally”. So I am doing “Granulated Sugar Scrub” method for one week. It’s really works for me. Now My cheeks much fair. That’s really really great. I am so happy about your wonderful article and many thanks for sharing those natural methods with us to keep our beauty. Castor oil is very safe to use. Just make sure you dilute it according to your skin’s needs since it can be drying. Can you tell me where your hyperpigmentation came from? It will help me help you better! I looked and looked but can’t seem to find the portions to the turmeric mask recipe. Can you post it please. Hello, I’d like to try your tumeric mask but have a few questions. I have sun spots from tanning in my 20’s-40’s. I no longer tan at all and am not in the sun very often. I have tried many products and organic remedies that do not work. Do you think the tumeric mask is the most effective way to rid the spots? Regarding the mask, how much tumeric do you use? Do you include all the items you listed for the mask? : “turmeric powder (preferably fresh)and mix it into raw honey, full fat yogurt, aloe vera gel, lemon juice or even fresh cucumber juice”. Will the tumeric stain my face? I will say though, lightening sun spots takes a lot of time and commitment. So just keep at it! Best of luck! I just stumbled upon this article while searching for home remedies for hyperpigmentation. I have already tried some of these (like lemon juice, raw honey etc.). Your turmeric mask sounds very good, will try that. I have a question on wheat germ oil, have you tried applying it directly? I have really acne prone skin so I’m not able to apply wheat germ oil directly. If your skin is really resilient then you may want to give it go! Just wondering if you might know of a natural way to depigment skin? I have vitiligo and am mostly devoid of pigment now, but would like to rid myself of some dark spots caused by being in the Florida sun. You can try these remedies or find a good quality skin lightening cream (I think Ulta carries a good one by Mario Badescu). Just be careful about being in the sun after using any type of natural or OTC remedy as they often make you burn very easily after use. I hope this helps! Tash, do you know if the scrub might work for vitiligo? I am wondering if it might help remove some of the pigment that is left behind. Most of my skin is now devoid of pigment, but I’d like to naturally get rid of the brown spots that can happen from being in the sun. Tash,I am ur fan now..U r amazing..I don’t know how I got hyper pigmentation on my face..I had very clear face before 2 months ago and suddenly there r few dark spots on my face..I am going to try ur remedies and I hope it will help me..Thanks dear ? Thanks for responding! Since getting rid of the spots onblog!heek is my main focus I will use tamanu VERY lightly because it’s so thick and I think i stopped using it because it broke me out a little, so i will spread it on very lightly. Or maybe tamanu on that area And grapeseed everywhere else. I have been doing the oil cleansing method at night with castor oil, rosehip, tamanu and neem. I bought them all separately every time i would read about an oil that is good for hyperpigmentation so i figured why not mix them all together! Im not really measuring the ratio of castor to the other oils. Is this a good idea? Am i decreasing the effectiveness of the oils by combining them then wiping them off when I wipe off the oil cleans? After I cleanse i dab lemon on the spots mainly in my right cheek then moisturize with a bit of grapeseed oil. Should I dab more of the oil(s) on and massage them in? In the morning I just wash face with warm water, acv with matcha green tea mix i made as a toner, then grapeseed. Maybe in the morning I should dab the oils on my cheek? I don’t know which one to pick. They’re all supposed to be good! Hi, i have terrible pigmentation almost all over my face. It has lightened with over with many different products and cost the earth. I must admit i was careless not using a sun block for most parts whilst working in scorching sun. At the moment i’m seeing a dermatologist and using Biofad at night and sunscreen during the day. It seems like ages since i’m caring for my skin and the results are so slow. Is there anything else i can try to speed up the treatment? I was trying to see what ingredients are in biofade but it doesn’t look like they list them on their website. So, with that said it’s hard to say if it will react badly with additional treatments. The one thing to know about lightening pigmentation is it does takes time, sometimes months and months. The best thing to do in your case would be to gently exfoliate 2 times a week OR use papaya enzymes to help your skin regenerate faster (you can read my article on papaya here). Since you are already using a brightening product it’s really really important that you don’t go overboard with treatments because you can damage your skin further. You can use these remedies interchangeably. Just make sure that you use the lemon juice on unopened skin and ONLY at night. Keep an eye on your skin and see which treatments it likes best. Getting rid of hyperpigmentation takes time, but if you are consistent it works wonderfully. Also protect your skin from the sun! Hi there , i have an uneven skin tone since birth my cheeks close to my eyes the skin tone is much darker than it is on my forehead and area close to my nose. Do you have asthma or hayfever? Any type of allergy to your environment? This can definitely cause darker skin in those areas! Hi there, I dnt have asthma or hay fever, could it be stress as well and the kind kind of contraceptive I use, because I have noticed that my skin in those area has gotten darker with family plannin pills, please advise, on what I can do or use it is so embarassing, I have juss bought tissue oil and been using it for 2 weeks , and I use it only at night. .
Turmeric face masks work amazingly for me! Hi! This article was so incredibly helpful! I just purchased a bottle of tamanu oil and lemons. I had a question about general skin care routines while doing the tamanu oil and lemon juice for hyper pigmentation…what should I was my face with and moisturize with after I remove the tamanu oil and lemon juice? I also was told to add frankenscence to my moisturizer for added benefits. Do you have any thoughts about that? hi, it’s me again! is there anything I can substitute the gram flour for and the tamanu oil for? It is a interesting and valuable item of info. Now i am joyful which you distributed this useful information here.. turmeric curcumin Be sure to keep united states up to date in this way. Thank you for expressing. Store bought honey is processed! Its best to use raw honey;!!!! And if your exfoliating because of hyperpigmentation you should protect your skin when going out in the sun! Wear sunscreen! Be very careful using sugar to exfoliate your skin! Anything like scrub pads to clean your skin can make your pores stretch! If your gonna exfoliate you should pick something that isn’t to grainy like sugar! Do you think this will help work for mask of pregnancy? The ingredients for this mask should be just fine for pregnancy. Of course you can omit the essential oils if you have especially sensitive skin during this time. @Tash thank you for the reply, what about manuka honey? can that clog the pores? Will any of these home remedies aggravate acne prone skin ? Yes, actually wheat germ oil will clog pores if you put it on too large of an area. I recommend using a q-tip to apply this one if you choose to use it. Natural remedies for hyperpigmentation is what I’m looking for these past few days and I’m thankful I have found your site. I have acne and I want to get rid of it in a natural way.Thanks for these info. It’s a big help for me. Hi. I have started using fresh aloe Vera on my face in the morning and evening along with ACV. I am Asian and my face is much darker than the rest of my body and people ask me what’s wrong with my face or why is it tanned. I also have brown spots which have all of a sudden appeared. I am very conscious. Are you in the sun a lot? Also, you may want to try gentle exfoliating for bed a few times per week. 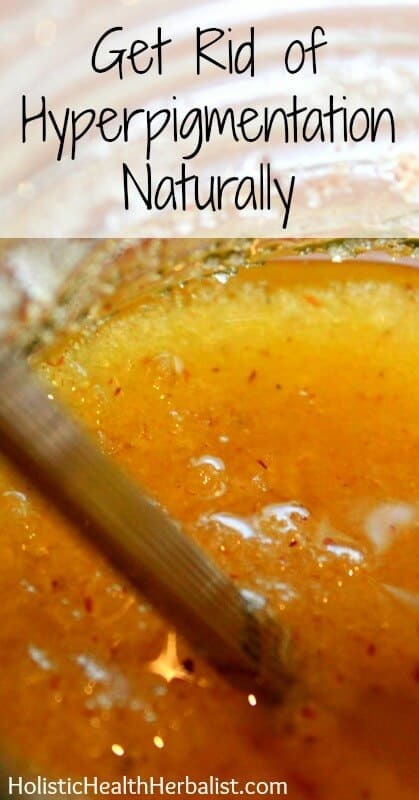 I would use a simple scrub of sugar and honey with a drop or 2 of lemon essential oil to help brighten the skin. Do NOT use this scrub during the day though because lemon makes your skin very sensitive to sunlight and could make it look worse. Using it at night is totally fine though! The aloe should help with cell turnover too! Thanks for taking out the time to post such crafty remedies. I’m curious what to try regarding my HPigmentation. I had a cut on my face which was inflammated due to an infection than after the swelling went away the skin was extremely darker. Grayish blueish. I was told what I used to treat my cut burned my skin. I’ve been applying whitening gels, hydroquine cream 4% and occasional Aloe gel but no real improvements. What would you recommend. The area is about the size of a baseball above my eye. Thanks in advance. That’s tough! How long have you been using the gels, creams, and aloe for?